REGULATES and BALANCES a woman’s body chemistry during her monthly cycle. Helps women REGAIN control and stop suffering from terrible mood swings, irritability and bloating. 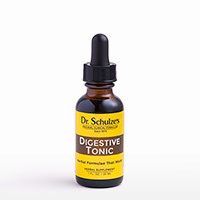 REDUCES bloating, MAINTAINS normal water retention and CALMS the nerves. Anxiety and Night Sweats Gone! Since I have been taking Female Plus, I’ve noticed a tremendous result. Mood swings have lessened, the anxiety is gone, and I don’t have night sweats anymore. I gave my 15-year-old daughter the Fem Plus and she was a whole NEW person. I am 48 years old and I also took the formula, and I am starting to feel like normal again. Thanks for a wonderful product!!! 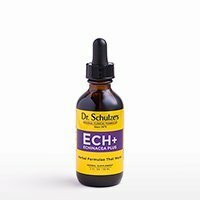 In his clinic, Dr. Schulze helped thousands of female patients naturally deal with premenstrual cycles. What causes extra discomfort during normal premenstrual cycles is actually very simple to understand. Prior to menstruation (your period), both of your major hormones, estrogen and progesterone, decline. Take a look at the chart below that graphs the hormone levels in a typical 28-day menstrual cycle. Female Plus Day 1 is the first day of menstruation. You would ovulate on about day 14. Day 28 is the last day of your cycle and then your period starts again. As you can see, your estrogen and progesterone hormone levels stay pretty level, until just before ovulation. By Day 11, estrogen levels climb quite dramatically, peaking within a day or two, and then start to decline. Progesterone levels begin to rise slightly later, around Day 13 just before ovulation, and peak later in the cycle, around Day 20. But both estrogen and progesterone levels begin to decline around Day 20 to 22 and decrease quite sharply Days 24 through 28. This normal, but dramatic reduction in hormones just prior to your period is enough to cause your body to protest. This isn’t a disease, and for some women, awareness of it and some lifestyle modifications can balance it right out. Suggested use: For a regular 28-day cycle, on the 18th day after the start of your last period, take 1 dropperful of FEM+ (Female Balance) in the morning and one in the evening. On the 19th day through the start of your next period, take 1 dropperful of FEM+ three times daily. This intake can be increased to 2 droppersful of FEM+ three times daily with an occasional boost of up to 4 droppersful during extreme cases. Discontinue the formula once your period begins. During the time prior to menstruating, what I call behavior and lifestyle modification, is of great importance. DON’T SET YOURSELF UP FOR FAILURE! First, don’t go clothes shopping, especially with friends. Everything will be tight, because of your water retention, and you will hate yourself. I had hundreds of crying women come into my clinic describing themselves as looking like a whale. Don’t do this to yourself. Also, do not set up any meetings with your boyfriend, husband or boss that you know will be tense or intense, especially meetings regarding future projects, budgets, house remodeling and definitely not where your marriage or relationship is headed. This is a time to quietly celebrate being a woman. Celebrate being ‘yin’, calm and meditative. Love and accept yourself. ‘Soothing’ is a great word and mantra during these 10 days. Hot baths, candles, essential oils, soothing music, stretching and breathing classes, exercise classes, long walks, easy chairs, sweat clothes and blankets. You get the picture? Sure, I’m aware that you still have to work and run your life, but plan some extra time for yourself, and don’t get into anything heavy. Look, I have had thousands of women patients with severe PMS heed my advice. Set yourself up to win!” My FEM+ (Female Balance) Formula is primarily designed to promote and maintain hormone levels in women. Similar to my Female Formula, my FEM+ has the addition of diuretic, nervine and antispasmodic botanical herbs. These additional herbs are added to support women emotionally, reduce bloating and maintain normal water retention, as well as to quiet and calm the nerves. 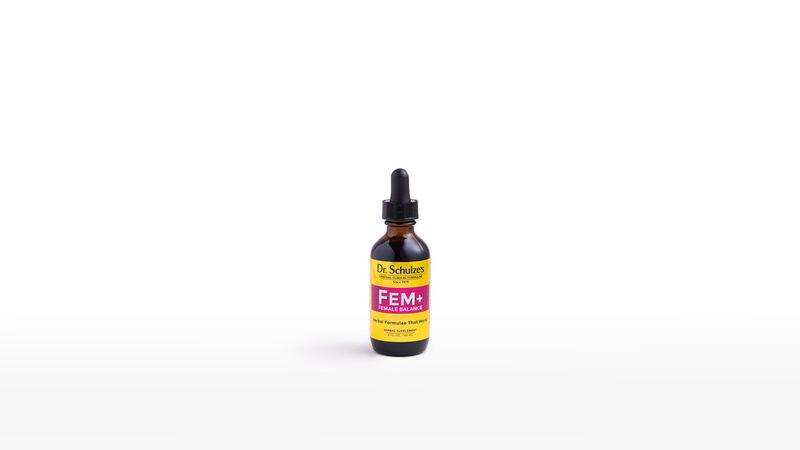 FEM+ is the Female Balance Tonic Dr. Schulze used in his clinic, and it is literally a godsend. It saved jobs, relationships, and marriages. How does it differ from the Female Formula? 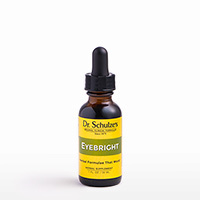 In addition to the same ingredients, this formula also contains nervine and diuretic herbs. At certain times of the month a woman’s sensitivity becomes heightened—sometimes to the point of explosion—and normal, everyday things become highly agitating. The nervine and antispasmodic herbs added in this formula relieve the hypersensitivity that is common during the monthly cycle, and even more during the changes that ensue in later years. Another very common complaint is bloating due to fluid and water retention. 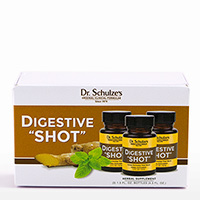 This is why Dr. Schulze added several diuretic herbs to this formula, like Uva Ursi Leaf, Juniper Berry and Corn Silk. For best results, use one bottle of FEM+ every month for a minimum of three months. You can continue to use this formula indefinitely with no negative side effects.